When a graduate student, math professor Crista Arangala was not concerned with culture or travel. Instead, she spent her time on the soccer field, playing semi-professionally and coaching a high school team. She was a bit of an anomaly, her passionate desire to teach unique from other numerical analysts headed to work in industry. When she met her husband, Sanjay, a fellow grad student and teaching assistant, traveling to the third world was far from her mind. 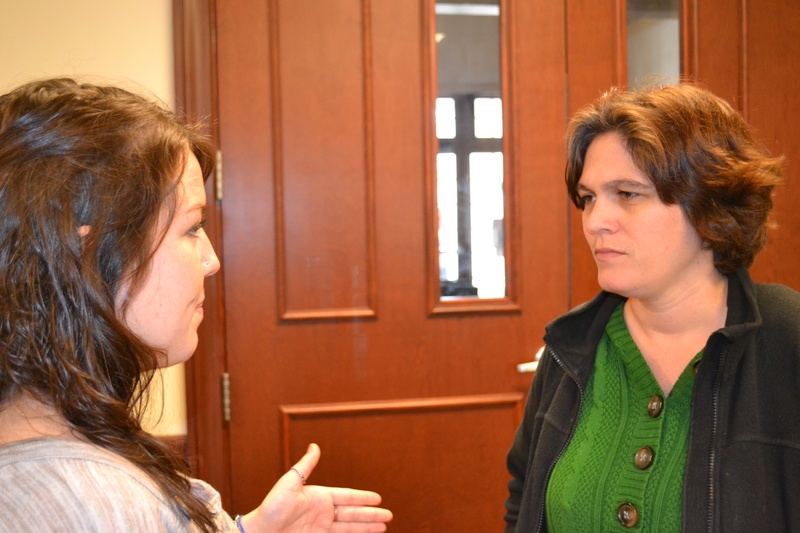 Arangala discusses a project with periclean scholar Natalie Lampert (Photo by Kellye Coleman). Yet time and opportunity can change things. Engaged learning is the hallmark of an Elon University education, the school’s website, brochures and campus tours highlight the spectacular programs and courses that impact students’ growth and college experience. Since her arrival at Elon in 2000, associate professor Arangala has found these opportunities have challenged her to discover more about various cultures and have reminded her of the importance of service. While attending graduate school at the University of Cincinnati, Arangala met Sanjay, a Sri Lankan student who had fled the country to escape the civil war taking place there. When they met, Arangala had no intentions of traveling to Sri Lanka. “I just wasn’t cultured enough to really think about going to the third world,” she says. But in 2002, she married and traveled there, and the challenges that come with meeting in-laws were made more difficult by the cultural barriers separating them. It was the first Elon program to make its mark on her life. The spring of 2006 marked the beginning of Arangala’s social activism in Sri Lanka. Seeing this need, she worked closely with Martin Kamela, an Elon physics professor, and several of her global studies students to create five science exhibits to be shown at schools in Sri Lanka. And she returned to Sri Lanka – this time to have impact. Her involvement within Sri Lanka grew from there. It was during a six-month stay in Sri Lanka on a teaching sabbatical that Arangala began work with the Periclean Scholars, an Elon program that would change her life in unexpected ways. Periclean Scholars is a four-year program in which a group of students participate in courses that lead to a social change project within a specific country. 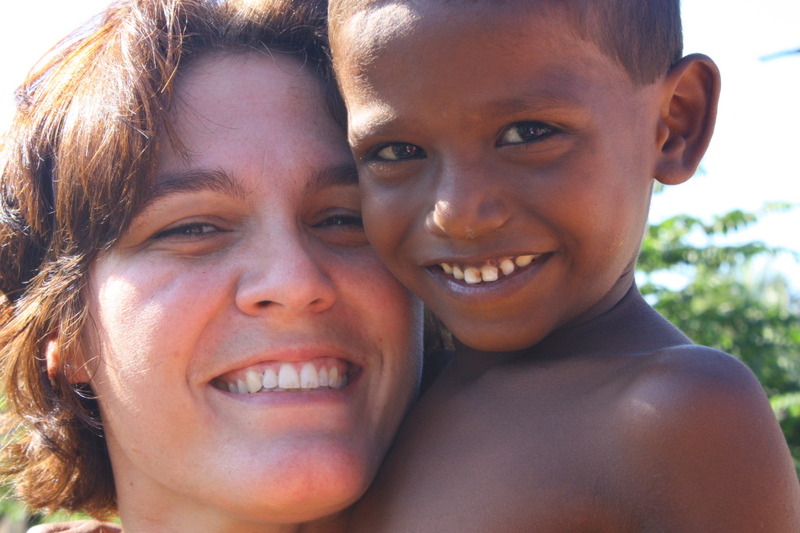 In 2008, Arangala began work with a group of students who would focus on Sri Lanka. She served as their adviser, a move that would challenge and inspire her. She has been forced out of her comfort zone on a continual basis, from spending significant amounts of time with students to working with students who differ from her in personality. “I’m a mathematician. Traditionally, we are not extremely social beings,” she says with a smile. Crista Arangala traveled to Sri Lanka with the 2011 Periclean Scholars and interacted with school children there (Photo by 2011 Periclean Scholars). 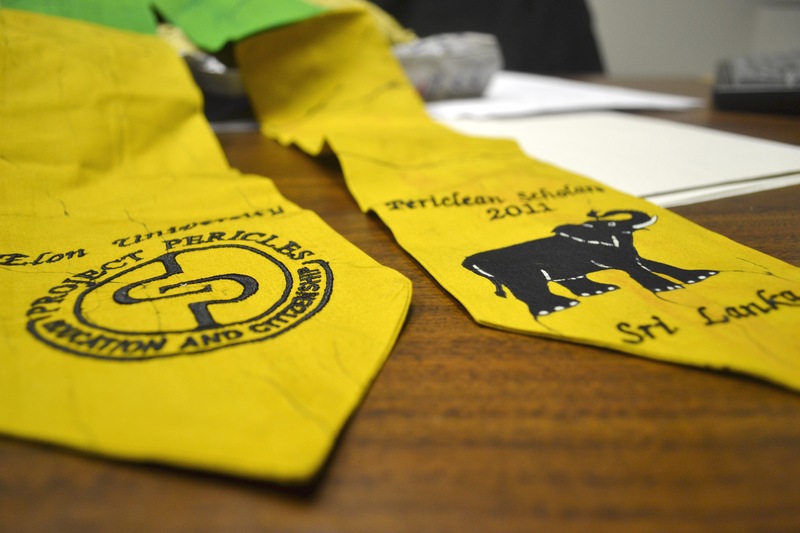 The 2011 Periclean Scholars decided to focus on environmental issues in Sri Lanka and, with the help of Arangala’s contacts there, have been working closely with two rural schools, sponsoring an environmental education club at one school and building and stocking a library at another. However, it was the opportunity to host the Leaders in Environmental Advocacy Forum (LEAF), an environmental conference, that took Arangala back to Sri Lanka. LEAF was a two-day summit hosted by the scholars, with the help of the University of Colombo. The conference provided the opportunity for Arangala and the scholars to travel to Sri Lanka for a month, hiking, eating, working and exploring together. It was during the trip that Arangala began to see just how much she valued her relationship with her students. “I definitely felt connected with all of them, which I thought was wonderful,” she said. She has come to value the relationships she has formed with these students, amazed to have watched them grow and learn during the past four years. The experience has been just as rewarding for them. “She’s definitely one of the most influential professors, for me at Elon,” Dirks says. Her desire to continue to form relationships of depth with more students on campus is just one of the ways her involvement in engaged learning has changed her perspective. She hopes to teach younger students next semester, which will provide the opportunity for her to develop relationships over time. As she prepares to watch the 2011 Periclean Scholars graduate, Arangala says she would like to continue what she has started. “I’m hoping to pick off a handful of underclassmen that might like to, at least informally, work on the project,” she says. Although the class will be graduating, her involvement in Sri Lanka is only just beginning. She hopes to pursue her own initiatives – establishing a pen pal program between her son’s class and one of the Sri Lankan schools she has worked with over the past two years, continuing to cook Sri Lankan food for her family and creating a Sri Lanka table display for her sons’ cultural day at school. These kinds of activities were once far from her mind, but the past four years reminded her of what’s important. “I’ve talked a lot about how important serving people is to me. That was really important in my life as a youngster, and I think I got away from that,” she says, her involvement with Periclean Scholars a reminder of that. Arangala now finds herself in a place of transition. Her colleagues want her to join them as they complete mathematical research, a prospect that is forcing Arangala to make a hard decision. “I’m at a point in my career where I have to define who I am. It is hard to be a full-time Periclean person and a full-time mathematician,” Arangala says. Regardless of her decision, there is no doubt that her involvement in engaged learning on campus has allowed Arangala to grow and has instilled in her a passion to help others do the same. “I’ve been really trying hard not to just find my place but also help my students, my children, and my family try to figure out where their place is here, on Earth, with people,” she says. Thanks for a great article Kellye!